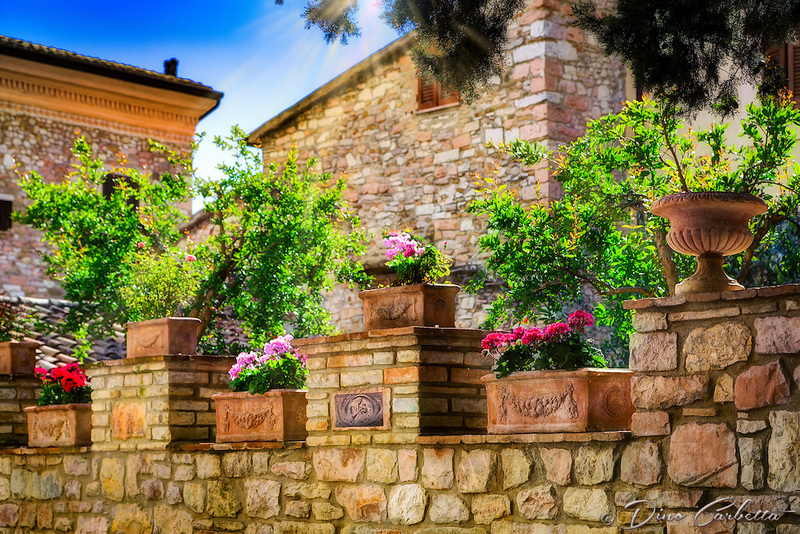 Italy is famous for its display of fresh and beautiful flowers outside the windows and doors throughout the countryside, and Assisi was no different with the exception of the perfection of their presentation. I am sure the Chamber of Commerce in Assisi is quite busy maintaining the continuity and beauty of Assisi, but perhaps there is no need as the residents all seem perfectly happy to respect and display all its beauty. The streets, walkways, and general environment were the most immaculate of any town I witnessed in Italy, and the most religious of any place on my journey. The town became a mystic and peaceful shrine in the early darkness of night after all the tourists departed, and all the prayers offered that day reflected and echoed off the ancient walls. Even the vending machines contained Rosaries, and its residents strolled about dressed in their religious attire with permanent smiles upon their faces. I am sure there are many remarkable religious destinations in the world, but in this photographer’s opinion…Assisi has no spiritual equal on this earth.